The *Most* Popular Beauty Videos Of 2018… Have You Watched These Yet? From creating the trendy smokey eyes to perfecting that cat eye flick, there is someone you gotta thank for helping you get your way around your makeup bag. No, not Kylie Jenner alone but the zillions of makeup tutorials flooding the internet. Most of us have spent hours binge watching these videos and learning the best of our makeup skills from them. If like us, you are a huge fan of online beauty videos and derive guilty pleasure watching them, check out our favourites from 2018. We have rounded up the best beauty videos from 2018 that went viral for all the right reasons. 1. This video on how to get the perfect beachy waves without using a curler (yes, you read that right) definitely gets a thumbs up from us. 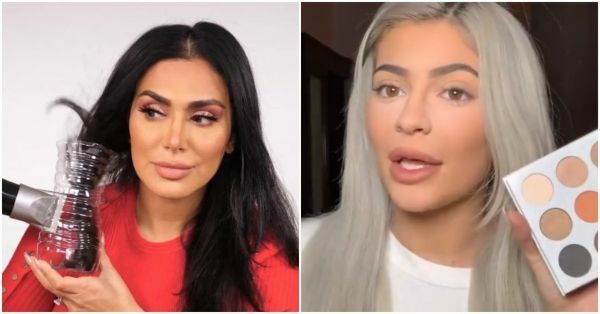 Check out how makeup guru Huda Kattan curls her hair in under two minutes using a..umm..plastic bottle. 2. Okay, so what God and genes can’t do, makeup can do! And this video is proof that we aren’t exaggerating. Check it out and you will know why we are absolutely in love with this Asian makeup transformation video by Beauty Tricks. 3. If there is one person who can line her lips with closed eyes, it is Kylie Jenner. This woman has some REALLY valuable tips to give on makeup. Watch this makeup tutorial for a step-by-step guide on the beauty mogul’s makeup routine. 4. What bothers you more - spotting a lizard in your room or freckles on your face? If you thought freckles haunt you more, you will love this makeup tutorial by Victoria’s Secret angel Kelsey Merritt on concealing those stubborn freckles. 5.The best thing that will happen to you today is this video by Wayne Goss. You won’t believe how insanely gorgeous eye shadow can look on small eyes if you know the right way to apply it. Worry not, because Goss is here in this viral video with his amazing tips to take you through the process. 6. Huda Beauty makes it to the list again! This time with this amazing video on recreating the glassy skin look using makeup. You don’t really appreciate the good things in life if you are not a little envious of the Korean glassy skin? In this video Alexandra Beth tells you how to get your bikini area waxed at home and also get rid of dark spots and ingrown hair. Now, this is a serious piece of advice all women need! Loved watching these tutorials? Tell us in the comments section which one did you like the most.